If you have been following my journey, then you know last time I did the last of the foundational work by adding the all important webbing and burlap. Now begins the assembly of, to me at least, what makes a chair a chair…the cushy stuff. If you take a peak at the photo in my last post you can see that when you add edge roll, you end up with a ditch. Unlike many municipal roads, this ditch or pothole of sorts needs to be filled in. What you use is cotton…yes real cotton. So those with allergies beware, you will get stuffy and you will sneeze. I just stuffed the cotton bits into the ditch until it is all even. Some areas may require more, others less. The last thing you want is a dent in your seat, especially where your knees hit. Tuft backing comes in basically two sizes for upholstery purposes. 1″ and 1/2″ thick. 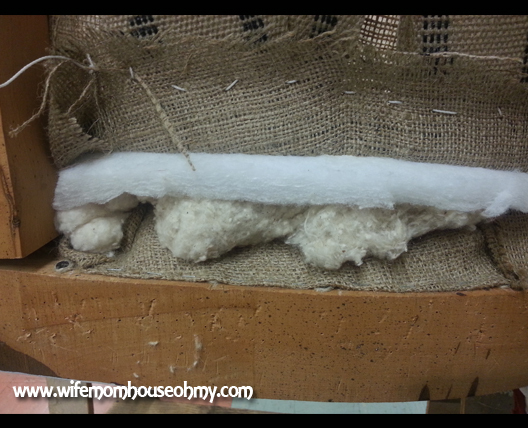 For the seat, I added one inch tuft giving the chair a firm base for the filling – where it is foam or cotton. A general rule – measure from your fullest part of your chair. This would be front center to back center and the front left side behind the leg to the front right side behind the leg on my chair. Cut your tuft to those dimensions in a square. Squish it through, cutting small notches for legs and trimming the excess. I feel like Little Miss Muffet who sat on her tuft-et. Okay, I know. Cheesy. Remember how I said you don’t want dents? This concept continues through most of this process. I then sewed the tuft to the edge roll. But in order to not have dents, I split the tuft and sewed in by going through the bottom layer only. The purpose was to make sure the tuft stayed put because a whole lot of pulling would be coming shortly. The front has no dents, so the back should be the same. You kind of feel your way with this one. I added bunches of cotton under the tuft in the low areas. Basically filling in the potholes. Now came the cushy. There are two choices for filling a chair. Foam and cotton. It was shared with me that the foam used can be harmful to cats, wears fast and deteriorates. The cushy doesn’t last. Its often used in loose chair cushions and commercially made pieces. Higher end or custom use cotton. 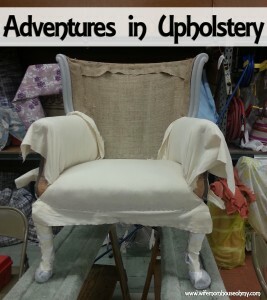 It holds up better and can be reused when reupholstering. Plus its plain ordinary natural cotton. I opted for cotton. I am so not planning on redo these chairs anytime soon so durability was key and, well, I don’t think my cat would appreciate me bringing home a kitty poison. Cotton comes in these cool massive sheets. You tear it to size (no cutting) for the seat and stuff it just like with the tuft. Ideally, depending on how cushy you want your seat, you add four layers of cotton. I wanted really cushy but also a tight seat. Peak at the picture, please note that the last two layers go over the edge roll. Again, no dents is a biggie. I filled in the sides, the front and the seat itself. To fill in the seat, you take a piece of cotton and pull off layers. Then, you would add that thin layer to the hole or dent, making sure to feather the edge into the previous layer. You just want to fill in the area without adding extra bulk. 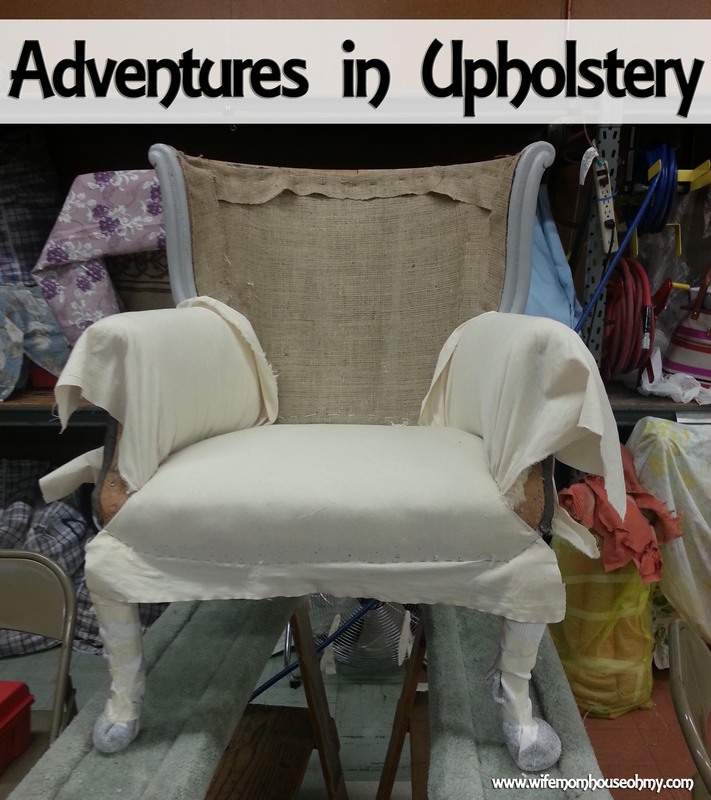 You know you are done when you can close your eyes, feel the seat and there are no dimples, dents or holes AND when you press down on the seat, there is about 1/5 to 1/4 of an inch between the cotton and the pull through location. In my case between my cotton and the bottom of my “plumber’s tape”. It should also have a dome like shape to the seat. This is so that when it wears, the seat doesn’t sag and still provides good support. Since my mother is a seamstress (an amazing one too), I am very familiar with muslin. In fashion, the muslin is your pattern and your test run. You make all your errors here so you don’t on the final product. Basically, its the same in upholstery. Let me start off by saying, everything that gets pulled, you add two inches to each side. For the seat, I used the same dimensions calculated for the tuft, then added an extra for four inches to length and width. I cut a square (which I didn’t cut on the grain so my square wasn’t straight) and then found center, and marked it. I then found center on the front and back of the chair. Lining up the center marks on my muslin with the center lines on my chair, I tack the fabric in front and back. Now begins the game of back and forth. I pulled and tacked the front so it was tight. Then I pulled from the back and tacked so its tighter. Then I went back to the front and pulled some more so it was tighter yet. Each time moving my tacks closer and closer together. Once I was sure the front and back were as tight as I could make them, I then repeated the process with the sides. Once its pulled tight, give it a spin. Sit in it and see how it feels. Don’t be surprised or worry about the need to add more cotton. That’s what the test drive is for. In the case of my channel back, the stuffing was just fine. In the case of my wingback King’s chair, it needed more so the tacks were removed and it got another round of cotton. All systems go with the feel, walk away for a day. Cotton settles. Come back the next day and see if the muslin needed more pulling or if it is still comfy. In may case, it was an all systems go on my channel back. Next, cuts were made at all the legs in order to create pulls so there were no lumps or wrinkles. These pulls were pulled and tacked in place. Next, I grabbed a gun – a staple gun – and some 9/16 staples. Then it was a matter of stapling the muslin to the wood. For this, I made sure the staples were close to the edge of the frame and were horizontal to the frame. I have to admit, it was pretty awesome getting to use the pneumatic stapler gun. It was like a sense of accomplishment as I stapled each staple securing the muslin to the frame. One step closer! Next post, I’ll move on to arms. Finish fabric is coming soon and the design will start to take form. Can’t wait to see it all done and finished.